90% of fonts can be split into two categories serif and sans serif. A serif font has small lines tailing from the edges of the letters, symbols and numbers. 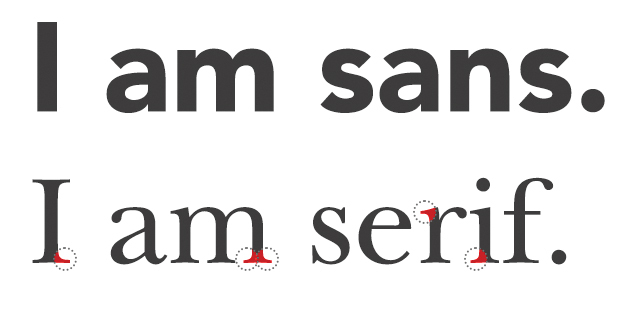 A sans serif font has straight edges as the name suggests, Sans the French word for without: Without serif. So how do you go about picking between the two when it comes to your design? Well there are a number of different aspects to consider first. Serif fonts as a rule of thumb are easier to read when they are used in print than when they are used digitally. This is because print works have a higher resolution than digital screens. With print documents having between 300 – 600 dots per inch and screens a much lower 100 dots per inch, however more modern Apple device can reach up to 300. This means in some cases the small “tails” maybe lost. With this being said it is only likely to cause an issue when the point size of the font is very low. Sans serif fonts are more recognisable letterforms due to the simplicity of their design. This makes reading the font easier. 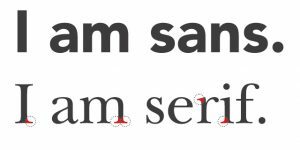 Meaning if you have an audience who have difficulty in reading or viewing the font, such as children or the elderly then a Sans font will probably be more suitable. Serif and Sans serif fonts create very different moods and feelings. A Sans serif font is most often associated with traditional, formal and classical styles that are formal and well established. Popular serif fonts include Baskerville, Rockwell, Times Roman and Georgia. While Sans serif fonts are considered much more simplistic down their stripped back design. This means they create a modern, clean and minimalistic feel often used to create bold and precise pieces of work. Some of the most well know sans serif typefaces are Helvetica, Futura, Gotham and Avant Garde. If you would like more information on how we can take your words and brand to build you an identity, please contact contact@thestudio4.co.uk or visit the design section of our website.